Business Meetings. I’ve been to a few. Sometimes meetings can be fun. You like the people you are meeting. They say things that you agree with. You say things that they agree with. Everything is going just fine. You go home knowing a win-win was achieved and the world has moved forward a step or two. These kind of meetings normally take place in an office or a meeting room somewhere where the chairs are suitably comfortable and the refreshments are pleasantly average. Then you have a meeting somewhere else, perhaps a railway station concourse, or an airport lounge where the culinary options are slightly more, well, varied. In my view, the best business meeting location is the one held in a restaurant. You and your co-meeters have something to distract you from the meeting subject matter. The menu. Perhaps the wine list, if the sun has passed over the yardarm (somewhere in the world). The only challenge to this whether to have two courses or three and whether your business acumen will stand up to the test of postprandial somnolence. And as you can see, this one was a lot of fun. Two small dishes sat side-by-side in a jaunty 45 degree offset. Those Belgians! Alongside the excellent presentation (loving the sliced strawberry) was a cool and smooth custard, sat underneath an slightly over done caramelisation. Just at the edges of the dish, the sugar was scorched and had a blackened treacly flavour. Whilst this in itself was not terrible, it meant an otherwise excellent sugar top left a toasted treacle tinge on the tongue… This should have scored more based on simple and classic presentation, but those toasted undertones mean only a 4/10 score. Better luck next time Midi Station. Travel has it’s up’s and downs. For work, it usually involves rushing from airport, to hotel, to meetings, to dinner, to after drinks, then back to the hotel for half a nights sleep. Repeat until you go home. The trick is leaving just enough time to actually see something of the place you’re visiting so you go home with some sense of the place, people and their culture. Whilst this post is Brussels-based, a recent trip to Athens afforded a couple of hours to visit the Acropolis first thing on a Friday morning. We arrived just on opening time, so were through the gate an hour before the mass of tourists had finished their buffet breakfasts and had boarded their coaches… Following a brisk walk through the lower level ruins of amphitheatres, discarded marble work and bath houses, we arrived to a largely deserted high point. 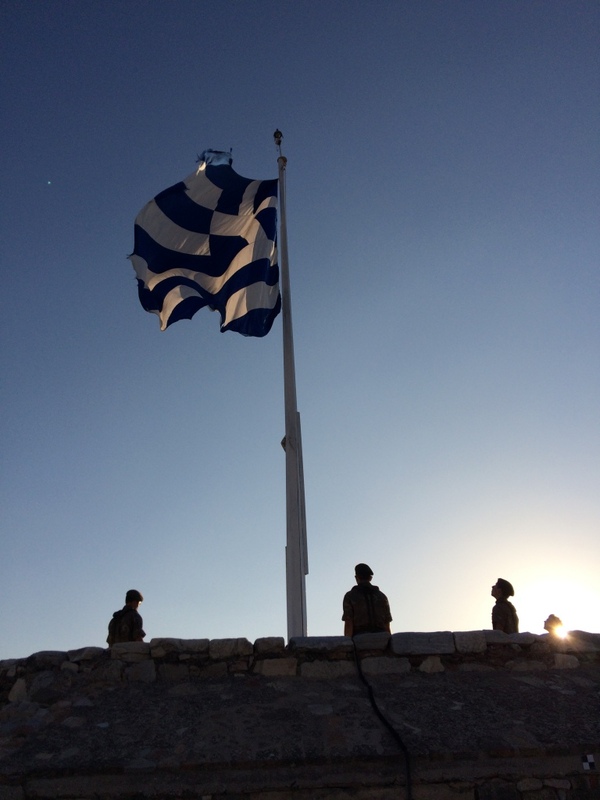 Whilst I could post the textbook image of the Parthenon, the more magical moment was watching the Greek Army cadets raising their national flag silhouetted against the early morning Athens skyline. A moment without conversation was enjoyed whilst they silently went about their daily ceremony. Magical. Relations with cutlery were thankfully resolved with the dessert course. 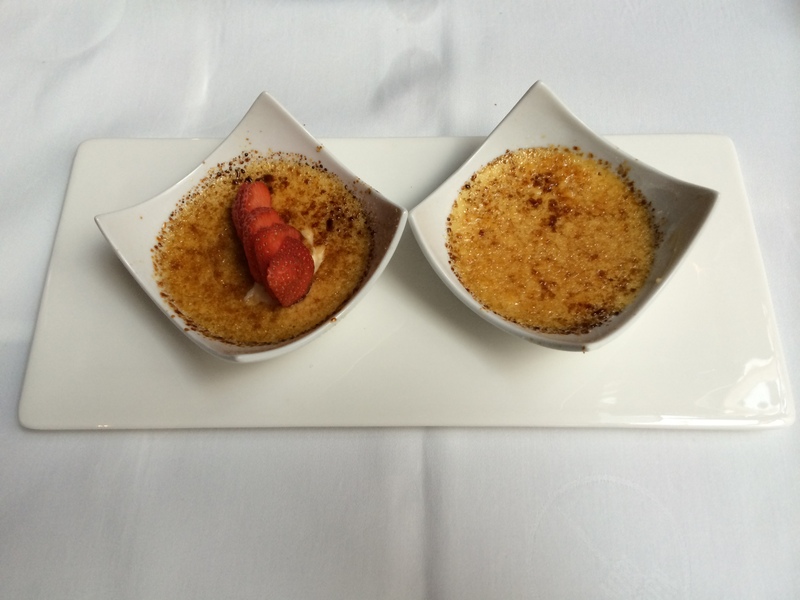 This petite brûlée arrived via conveyor and was simply done. No fuss. No pretence. A 2mph delivery. Custard and sugar in a (fortunately) small earthenware dish. Like the restaurant, this was a casual and unfussy final course. Sugaring was light and nicely crackable with a simple spoon tap. The custard was cool, not cold, light and deliciously smooth. It was decidedly on the right side of sweet and big enough to be shared with my dining fellows. Which is exactly what we did, and worthy of a neither outstanding nor terrible 6/10. Readers of this blog will know that I travel to the USA a few times a year, primarily to Raleigh in North Carolina. It is a lovely place. For a Brit, the weather is great pretty much all the time. April and October are the best months with good temperatures and lighter humidity. Since I first came here in 2005, a lot has changed. Many blue chip organisations have large locations here, and as a result, a lot of local people have moved here for work = lots of traffic. More importantly, the number of restaurants have grown exponentially and there is a veritable plethora of choice. My first real love was Second Empire, located in downtown Raleigh. It’s an old Victorian era building with an exquisite menu introduced to me by my mentor and career educator Barrie Parker with a hugely varied menu. 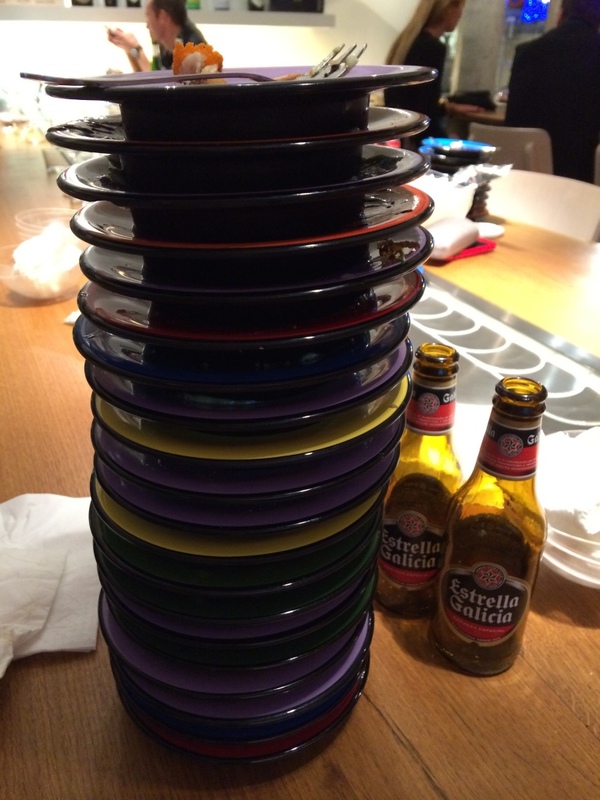 My second love, was my first introduction to sushi and sashimi at the lovely, and somewhat low rent Waraji. It’s nothing fussy or pretentious, just simple Japanese fayre simply presented with cold Asahi beer. However, tonights quirky and somewhat left field brûlée was at another culinary first for me, at Brasa the Brazilian Steak House. For those of you who have not had the pleasure of a Brazilian steak night, the concept is simple. You control a Green or Red beer mat traffic light system. Green = bring me meat, lots of of it, don’t stop. Red = seriously, stop. Do I look like I need more protein?! (Cut to shot of Monty Python’s Mr. Creosote). Once the meat is done, the desert offerings come to the fore. 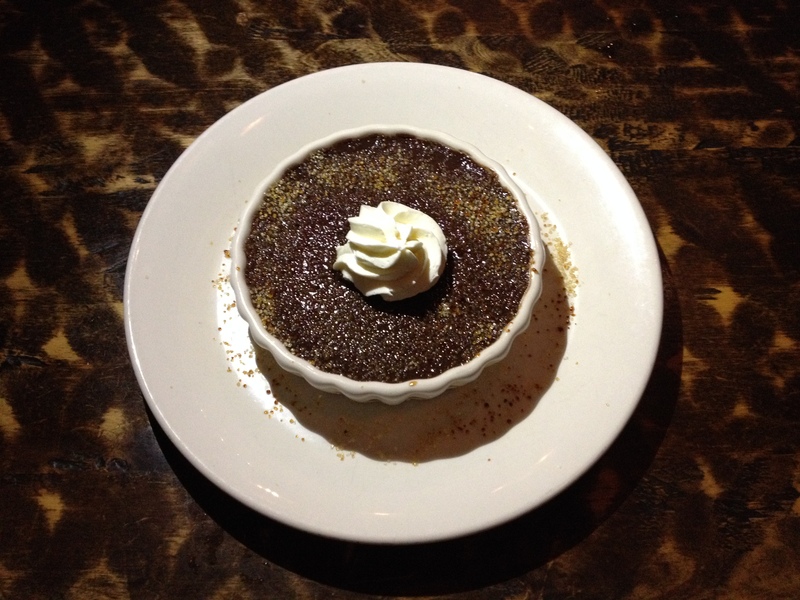 And a Chocolate Brûlée was the choice in hand. Lets just say it was ‘interesting’. Spoons for the table were ordered, just in case. In fact, it was interesting. Overtly rich and dark. Caramelisation under done but somewhat lost in the black depths of the chocolate. 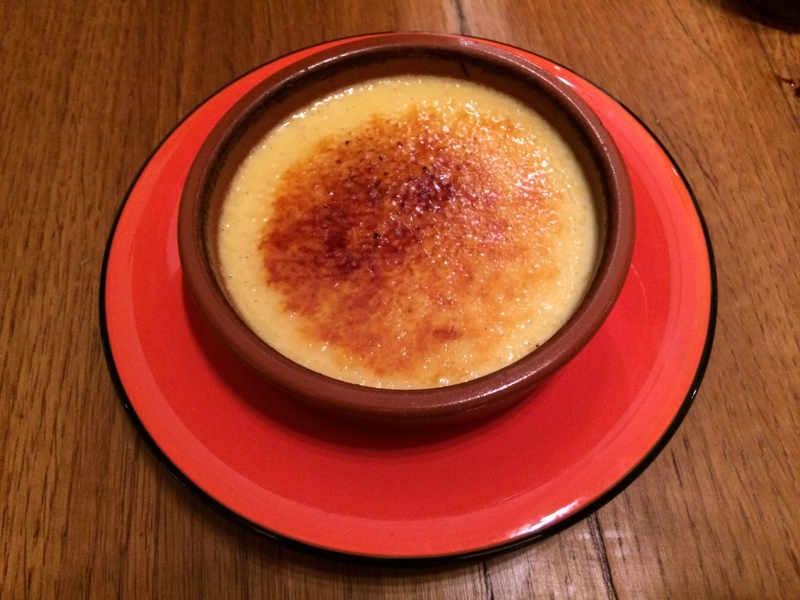 In truth, it wasn’t really a crème brûlée in the traditions of Trinity Cream, but it did explore culinary boundaries that this kind of pudding should. Take something and change it. See what happens. For me, it was just a tad too dark and heavy, and lacked the sweetness I hoped the chocolate would impart. Perhaps they used dark rather than milk chocolate. A good interpretation but only worthy of 5/10.